TigerFish: A Memoir of a South Vietnamese Colonel’s Daughter and Her Coming of Age in America by Ms. Hoang Chi T Truong is a compelling memoir that follows a young woman’s journey through the turbulent years of the Vietnam War to finding refuge in the US, and the challenges that came along the way, a story that is well captured in lyrical prose and in an irresistible voice. The memoirist takes readers on a delightful journey through her childhood, growing up as the daughter of a South Vietnamese colonel, and how the war changed everything. Readers are introduced to the life of the protagonist and what the war meant for them. The decision to seek asylum in the US wasn’t an easy one to make and the author introduces readers to the challenges the protagonist had to face to immerse herself into a new setting and culture. Ms. Hoang Chi T Truong’s memoir is a powerful story of war, family, love, and survival written in a lyrical, absorbing style; it paints the perfect picture of life in war-torn South Vietnam. I enjoyed the masterful use of descriptive prose that gives readers great images of the setting, including the streets, the geography, and the places where the action takes place. The story feels real and the themes are masterfully integrated into the gripping narrative. 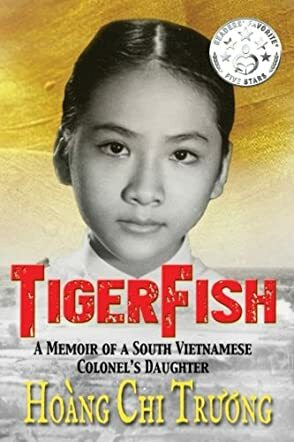 TigerFish: A Memoir of a South Vietnamese Colonel’s Daughter and Her Coming of Age in America is very entertaining and inspiring, a coming-of-age story that brilliantly handles the theme of survival. The memoir reads like well-crafted fiction with an exciting setting. I loved this true story, because of it's love, bravery and courage. I have had the pleasure of attending two lectures in Fresno, CA by the author. The latest was at the Madden Library at Fresno State University. My heart goes out to the refugees who flee in order to live. This story is exactly as Ruffina Oserio describes above. I have recommended it every chance I get. People who got back to me said they couldn't put it down. I couldn't either!